X-Heat Technology by KQC is a unique new system that softens hair faster, seals in cuticles, locks in hair color to give a healthy, silky professional finish. X-Heat is specially formulated combination of ceramic and tourmaline gemstone complimented with precise heat technology to generate negative ions and far-infrared heat – preserving moisture and leaving hair silky smooth. The result is any hair-styling creations can be easily achieved without the frizzles and static electricity of conventional products. 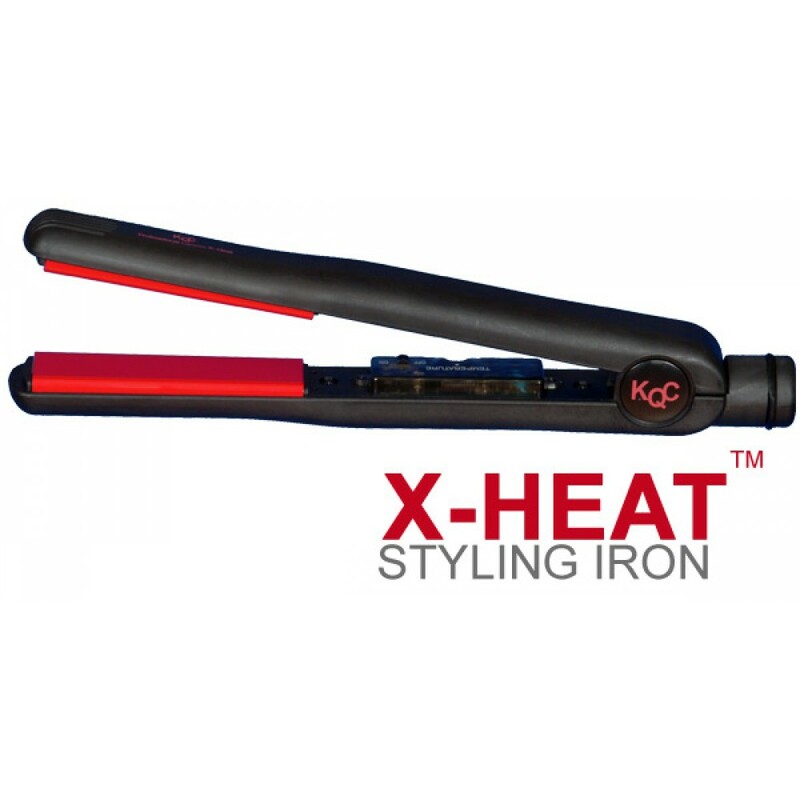 X-Heat Technology by KQC is the future available today for beautiful, healthy styling. Negative ions retain hair moisture and reduce frizz. Far-infrared heat styles faster and softens hair. Plate color changes to dark red when hot. Variable heat settings from 72°C-210°C (140°F-410°F). Erogonomic design to straighten, flip or curl hair with a twist of the wrist. 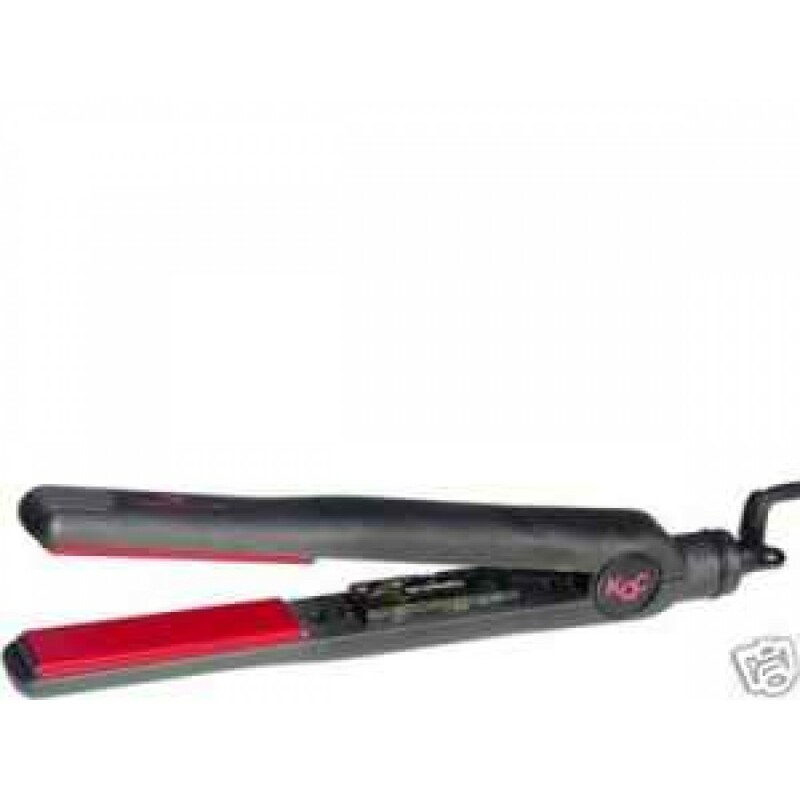 Conventional styling irons provide heat that is generated with shorter wavelengths. These heat have wavelengths that are not sufficient to penetrate hair or the scalp for healthy styling. Because of non-penetration, these shorter rays heat the hair surface first and conduct heat to the cortex. The hair is heated by means of conduction from the surface which causes frizzy, dry and damaged hair. KQC’s X-Heat Technology uses the longer wavelength from Far Infrared technology to generate deep penetrating heat. This penetrates directly into the cortex of hair cuticles, heating from the inside out. It creates an effect that relaxes and softens hair. The hair is heated evenly, giving a gentle fast styling in half the time thereby reducing heat exposure. Water molecules on the surface of the hair break apart into smaller droplets and get absorbed into the hair. Moisture is then locked within the cuticles to give a protective barrier to reduce chemical and bacteria build-up. Ionic / Negative Ion Technology: Negative ions are atoms that can stop the growth of bacteria, fungi, etc., resulting in healthier hair and scalp as it's Antibacterial. Negative ion energy is powerful enough to break apart clusters of water molecules. The smaller water molecules penetrate into the hair shaft by slipping between the cuticles, adding plumpness/volume to hair. The bombardment of negative ions also closes the hair cuticle, which is very good for the health and appearance of the hair. I've had this iron for 2 years now and it still works great. Best beauty investment I ever made. It heats up almost instantly and I can get my hair straight in no time. It just glides through my hair with no tugging. My girl friends always use mine when they get a chance because there's just no comparison to the cheaper irons! I am very impressed! This flat iron made my hair pin straight, it also curled my hair perfectly too. I tried both! It heats up quick and I also received a Mini KQC, bain de terre botaniceuticals, KQC Thermal Shine Spray and a sample of Macadamia Deep Repair Masque! This flat iron is worth every penny itself, let alone all the little bonus items! I wasnt sure what to expect from this flat iron because I recently bought a GHD & i didnt think there was any other straightener that would compare to it, but im so glad i bought this KQC flat iron, it works amazinggggly!! It leaves my hair sooooo soft. And it curls just as wonderful as it straightens.